Centennial Park ski hill during the summer. The park was opened in 1967 for Canada's 100 birthday by the then Borough of Etobicoke and was part of the Hirons' dairy farm (the remaining part of the farm was sold for residential development in 1968). 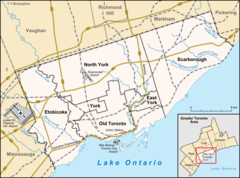 In 1998, when the six municipalities comprising Metropolitan Toronto were amalgamated, the park was integrated into Toronto Parks and Recreation from the former City of Etobicoke Parks Department. This should not be confused with an identically named small city park in the east end of Toronto, on Centennial Road, Scarborough, which was also inherited by the amalgamation. In 2015, the park hosted the BMX cycling at the 2015 Pan American Games. After the Games, the BMX track became a legacy site for public use. Centennial Park Ski & Snowboard Centre, a small alpine skiing hill created on top of old garbage landfill. It features one t-bar and a conveyor lift, serving one intermediate slope, one beginner slope, and a snowboard slope. It is one of two ski hills located within the boundaries of Toronto, the other being the North York Ski Centre. ^ "Centennial Park - Etobicoke (Toronto) neighbourhoods". Moving in Canada. Archived from the original on 2015-09-29. Retrieved 2012-05-11.